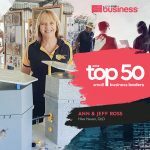 In 2011 Ann and Jeff Ross discovered a colony of honeybees had made a home in the wall of their mechanical workshop in Beerburrum. Many people might have followed the advice of friends and called in the pest control but having come from a family of apiarists; Jeff coaxed the bees into a box and before long bees and honey had become their passion. Ann’s new-found interest in bees and her love of stingless native honey meant it wasn’t long before there were eight thriving colonies in the backyard. What happened next launched Hive Haven in a new direction toward saving both our stingless native bee. The heat waves of 2013 in south-east Queensland devastated both honeybee and stingless native bee colonies throughout Queensland. Beerburrum was no exception. Ann lost her 8 native bees which was devastating. 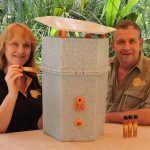 In June 2015 , a concept 3D printed hexagonal stingless bee box was put on display at various locations around the Sunshine Coast. This enabled people including native bee keepers, scientists, engineers to contribute valuable knowledge. Ann and Jeff thank everyone for their generous support. Every idea or suggestion helped. Fast forward to 2017 – Hive Haven received funding from the Queensland Ignite Fund to support the development of the Hive Haven V9. The Hive Haven V9 is specifically designed to maintain a stable temperature and enable the harvesting of stingless native bee honey and propolis. It not only looks great but is functional as well. The design enables a variety of insulation materials to be used depending on the temperature and geographical region. This ability to insulate the hive for both hot and cold climatic conditions means native bees can now survive in areas where previously they would have perished. Our goal is to raise the awareness of this threatened species. We are working with our community & like minded social enterprises to deliver sustainable pollination for food crops. We support the ethical commercialisation of European and stingless native bee products.